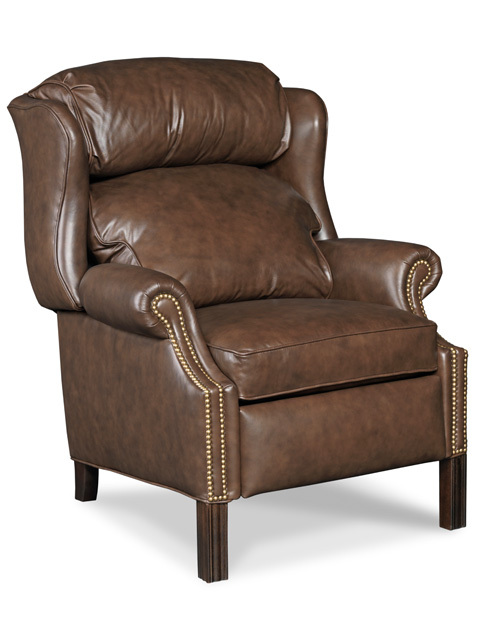 Name:CHIPPENDALE Description:RECLINING WING CHAIR W/BRASS NAILS Style:4114 Cover As Shown:9873-88 Standard Finish*:MH-MAHOGANY Standard Cushion*:HR FOAM Pillow Type:SEMI-ATTACHED Std./Opt. Release*:PUSHBACK Power Recline Option:PR-POWER RECLINE [?] Standard Nail*:FRENCH NATURAL #9 No Nail Option:AVAILABLE Overall Dimensions:W 33" x D 36 1/4/" x H 43" Seat Dimensions:W 22" x D 18" x H 21 1/2" Arm Height:25 1/2" Seat to Back Height:22" Distance from Wall to Full Recline:18" Chair In Full Recline:66 1/2" Ship Weight:110 lbs.